When Roswitha Wilkerson immigrated to America 46 years ago, she didn’t know she had inherited polycystic kidney disease (PKD) from her father. At 19, she had a portion of her left kidney removed because of cysts and recurring infections in her bladder. Still, the doctors didn’t tell her the cysts were related to PKD. In Germany, her father was on dialysis for many years. When he passed away, Roswitha and her two sisters decided to get tested to see if they had inherited PKD. At this point, Roswitha was in her 40s. Roswitha and one of her sisters tested positive for PKD. Although Roswitha has known about her kidney disease for more than 20 years now, her illness has not defined her life. Last year, she travelled to Hawaii and Germany. Throughout her life, she has maintained her physical health with regular exercise and fitness. 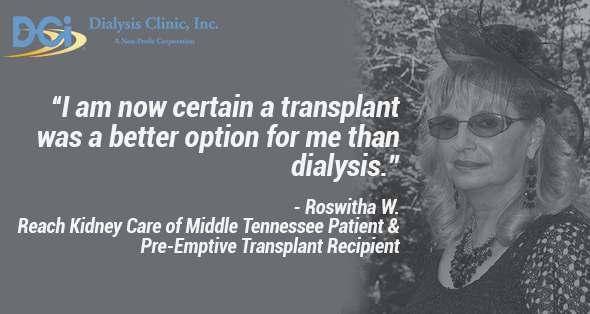 When Roswitha’s kidney function dropped below 20-percent, her nephrologist in Nashville, Tenn., Dr. Pettus, referred her to Reach Kidney Care of Middle Tennessee. Her care team provided comprehensive education, providing insight about the best access options for dialysis and the different renal replacement options. She met with the dietitian and the transplant coordinator, Christa, who first explained the kidney transplant process. Roswitha shared that her care coordinator, Ed Dennis, NP, made a big impression on her son, Chad, who attended an appointment with her. After the meeting, Chad told her that if she needed a kidney, he was going to give her one. Her care team met again to discuss the matching process. It would take some time before they knew if Chad would be a viable match for his mother. Her team also explained the benefits and risks of a transplant. Roswitha learned that the current rate for a pre-emptive kidney transplant, a transplant which occurs before dialysis treatment starts, is less than 3 percent. “Although the percentage of pre-emptive transplants is currently low, pursuing a pre-emptive renal transplant makes perfect sense because of the enormous benefits to overall health. The quality of life is better compared to experiencing dialysis or the symptoms that develop when kidney failure progresses,” explained Ed Dennis, NP, Reach Kidney Care of Middle Tennessee care coordinator. “Pre-emptive transplantation provides a possibility to ‘leap-frog’ over the symptoms associated with the kidney disease progression and quite possibly avoid critical illness and dialysis all together,” he continued. For Roswitha and Chad, that education was just what they needed. In March, Chad became her living donor. She never had to experience a single day on dialysis.